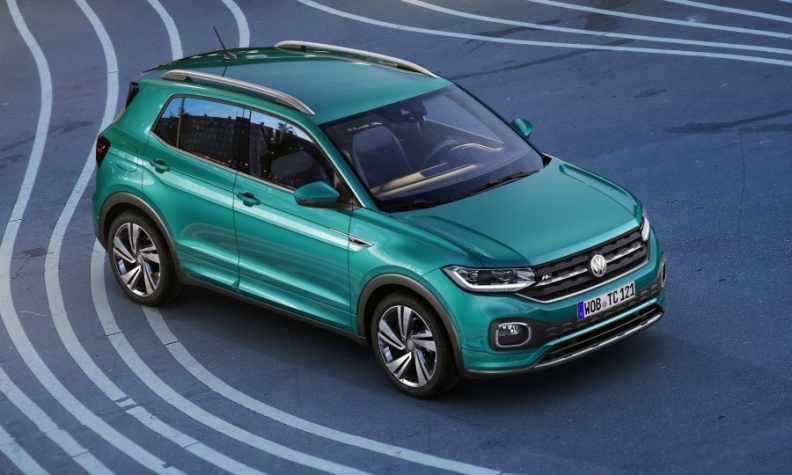 Key new models that could drive European sales this year include the VW T-Cross (shown), Renault Clio and Mercedes-Benz GLB. 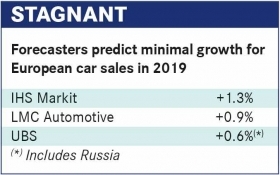 The European auto market’s run of solid gains since 2013 may be coming to an end, with analysts predicting that sales will be largely flat in 2019. Part of that is a natural conclusion to a positive economic cycle, they said, but other factors will play a role, including uncertainty around Brexit, the possibility of U.S. tariffs on imported cars, the volatility of the Italian economy and lingering effects of the new Worldwide harmonized Light vehicle Test Procedure (WLTP). "In general, we are expecting still some slight growth for 2019," said Martin Benecke, director of European sales forecasting at IHS Markit. For 2019, IHS is predicting growth of 1.3 percent in Europe, compared with an expected 1.6 percent in 2018. Among other analysts, LMC Automotive sees an increase of 0.9 percent, while UBS is forecasting an increase of 0.6 percent overall in Europe (including Russia), with a drop of 0.9 percent in Western Europe. Moody's predicts growth in Western Europe will be 1 percent, but the company recently downgraded expectations for 2018 to growth of just 0.7 percent, from 2 percent earlier in the year. The downgrade is largely due to the effects of WLTP, especially in Germany, said Falk Frey, a senior vice president based in Frankfurt. "Most of the risks are on the downside," Frey said. "I don't see much on the upside, except that you could argue that some markets, notably Italy and Spain, are still far below their previous peaks in the cycle." The European Union forecasts overall economic growth of 2 percent in 2019, essentially the same as in 2018, down from a post-recession peak in 2017. However, the weakest growth -- 1 percent or less -- will be concentrated in the largest auto markets, including the UK, Germany, France and Italy. Most Eastern European economies are expected to grow 3 to 4 percent. Consumption is expected to rise by 1.6 percent, the same as in 2018. Benecke said the recovery from the last recession had largely run out of steam in Germany, Europes largest auto market, and France, while Spain and Italy still have a little headroom for sales growth. "We see sideways movement in Germany," Benecke said, adding that possible risks are the threat of U.S. tariffs on imported cars, which would hit Germany disproportionally harder than other European countries, and a less-than-smooth transition if, as expected, Chancellor Angela Merkel leaves before the end of her term. Attractive trade-in or scrappage offers, designed to remove older diesel vehicles from the roads, will help support the market. Italy, however, could be a trouble spot. The country's GDP declined in the third quarter of 2018, the first time since 2014 that has happened. "We have reduced our assumptions for Italy a bit, but we are still quite positive because they still really have an old average car parc age," Benecke said. Jonathon Poskitt, director of global sales forecasting at LMC Automotive, said Spain has the largest potential for growth in the top five European auto markets next year, at a predicted 4 percent. "Employment growth continues to drive the economy," he said, adding that expected volume of 1.33 million auto sales this year is still below the pre-recession level of 1.6 million. For the third year in a row in 2019, Brexit will have a significant effect on European auto sales, analysts said, but the March 29 deadline for Britain to leave the European Union is now just months away, regardless of whether an agreement with the EU is reached. The UK could see modest sales growth in 2019, analysts said -- provided Britains exit is negotiated smoothly. Moodys is forecasting growth of 1.5 percent, Frey said, noting that while the firms base case scenario is an "amicable agreement without big disruptions," the risks "are shifting toward a harder Brexit." Poskitt of LMC also expects that there will be some sort of favorable Brexit agreement. With that in mind, LMC is forecasting growth of 1.3 percent in the British auto market. In the event of a "no deal" Brexit, however, "Our assumption is that the market would drop around 7 percent," he said. The switch to WLTP rules shook up monthly sales volumes in 2018 and more aftershocks are expected. "The disruption that WLTP has caused will continue well into 2019 -- certainly into the first quarter," BMW brand sales boss Pieter Nota told Automotive News Europe. "We still feel the impact. In addition, the European market is quite volatile due to uncertainties on the situation in Italy and Brexit." IHS's Benecke, however, thinks that WLTP tests will not have an effect on overall sales in 2019. "For some brands, especially Audi and Porsche, we will still see some disruptions in early 2019," he said. "But by the end of 2018 most brands will have their full portfolios available." The switch to WLTP rules sent a shockwave through monthly sales volumes in 2018. Many models were temporarily kept off the market while test centers worked around the clock to reduce the backlog. At the same time, automakers plied buyers with incentives to move vehicles that had been produced but not certified ahead of the Sept. 1 deadline. As a result, sales soared in many countries in July and August, normally slow months, and fell in September, October and November -- usually a time when key now models reach showrooms. "The disruption that WLTP has caused will continue well into 2019 -- certainly into the first quarter," BMW brand sales boss Pieter Nota told Automotive News Europe. "We still feel the impact. In addition, the European market is quite volatile due to uncertainties on the situation in Italy and Brexit." Volkswagen Group was perhaps the hardest-hit, partly because as Europe's biggest automaker it had so many variants to certify, but also because it was not prepared for the complexity of the tests, which are much more involved and take longer than the previous cycle, the NEDC. The company idled factories as certification lagged. "We have to be self-critical and admit that we didn't control the WLTP project enough," CEO Herbert Diess said last September. Benecke said he thought that WLTP tests would not have an effect on overall sales in 2019. "For some brands, especially Audi and Porsche, we will still see some disruptions in early 2019," he said. "But by the end of this year most brands will have their full portfolios available. The whole WLTP issue is temporary and won't really affect volumes." JATO Dynamics said the WLTP’s impact would continue through early part of 2019. "If we add this to the already challenging Brexit situation, trade tensions, Italian budget issues and the slowdown of the Chinese and U.S. car markets, the European car industry is likely to see lower growth rates in the coming months," JATO said a report in late November. As of mid-November, just 63 percent of all automakers’ European model variants had been certified, it said. Another constant in 2019 will be the growth of the SUV and crossover segments, at the expense of traditional body styles such as sedans and hatchbacks. However, the rampant growth will moderate somewhat, analysts said, with sales of large SUVs slowing. "The SUV boom is not over," Benecke said, "but in some segments we could be at a saturation point." He said VW Group’s expanding lineup of small SUVs and crossovers will drive sales in those sectors. "There is still a lot of potential in the B-segment, because they don't cost much more than conventional small or compact cars," he said. Key launches that could drive sales include the VW T-Cross crossover, based on the Polo, and a Skoda Fabia-based sibling, reportedly to be called the Kosmiq. Others include the latest-generation Renault Clio, the Mercedes-Benz GLB crossover and the newest Toyota RAV4, analysts said. One segment that may have to wait another year or two for a breakthrough is electric vehicles. Mercedes (EQC), Audi (e-tron) and Jaguar (I-Pace) have all launched high-end models, and the Tesla Model 3 will arrive in Europe this year, but they will not have a significant effect on the market, analysts said. That is expected to change in 2020 or 2021 when automakers must meet the EU’s fleet CO2 emissions standard of 95 grams per kilometer, down from 118.1g/km in 2017. "Automakers will wait until the last minute" before introducing lower-priced electric vehicles, Benecke said. "They are hoping that governments will add more incentives for electric vehicles, especially for the mass market." Moody's Frey said full-electric vehicles would remain a "niche market" until the next decade, with automakers mostly turning to hybrids to meet CO2 requirements. "The growth rates for battery-electric vehicles and hybrids will look impressive" in 2019, he said, "but it's due to the very low base we are starting from."